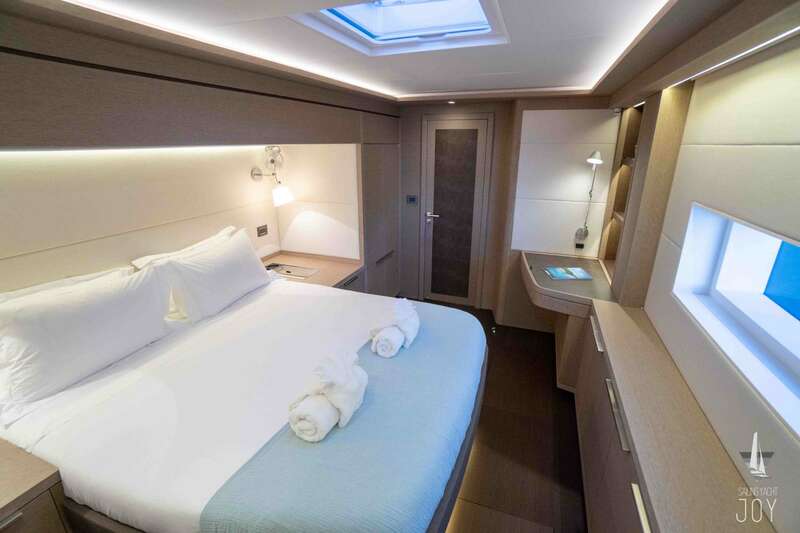 Since its debut in 2016, the new Lagoon Seventy 7 catamaran has proved to be an exceptionally popular yacht that has been in record-breaking demand. 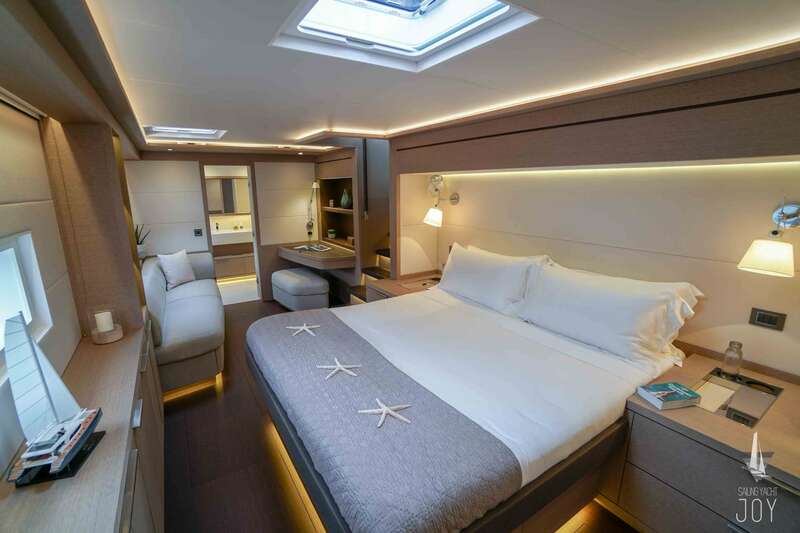 Built in France by CNB and designed by a super-star team of VPLP, Patrick Le Quément and Nauta Design, the Seventy 7 is the new flagship for builder Lagoon and boasts gentle and precise lines for a refined and harmonious overall look. 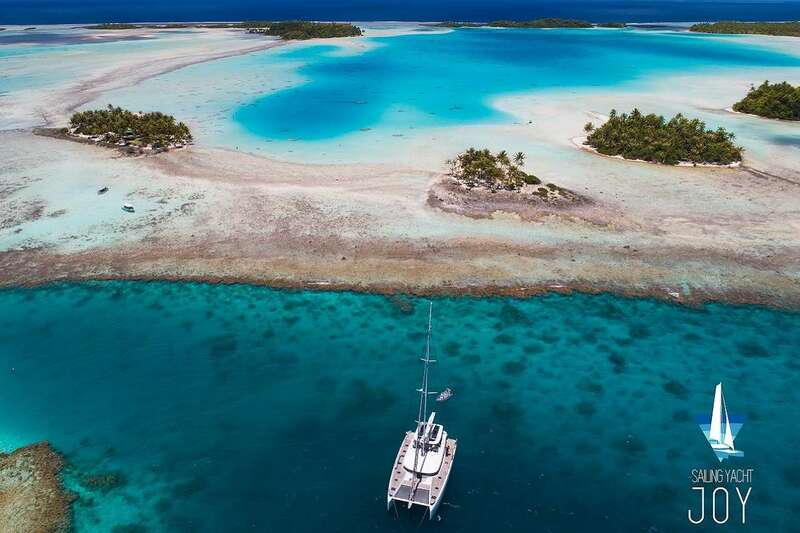 SY JOY is definitely one of the first Lagoon Seventy 7s that are available for charter in the world. As an unbeatable choice for a bespoke yacht charter holiday, she combines its pedigree design with luxurious styling, a spacious on board layout and exceptional performance to create a perfect all-round yacht that is ideal for every kind of adventure on the water. 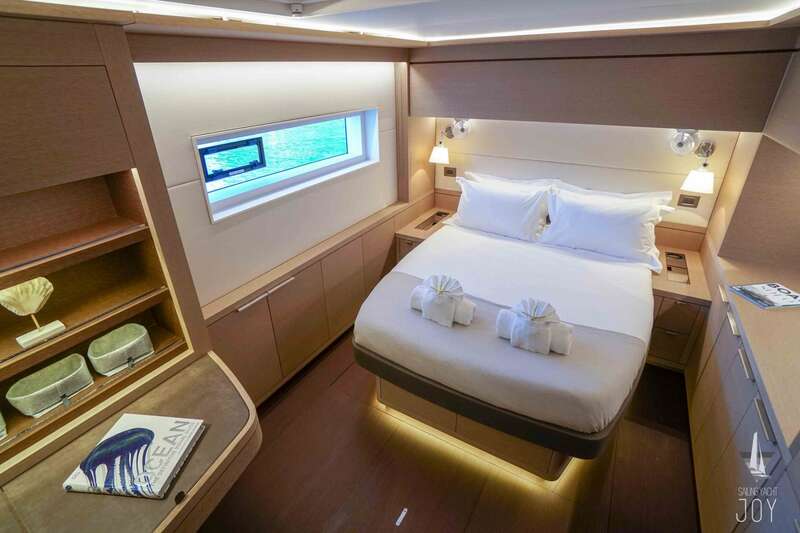 Lagoon designed the Seventy 7 to cater to a wide range of uses, including coastal cruising, global exploration and charter and the yacht does not disappoint! Whatever your dream charter, the Lagoon Seventy 7 is the perfect base to enjoy it from. 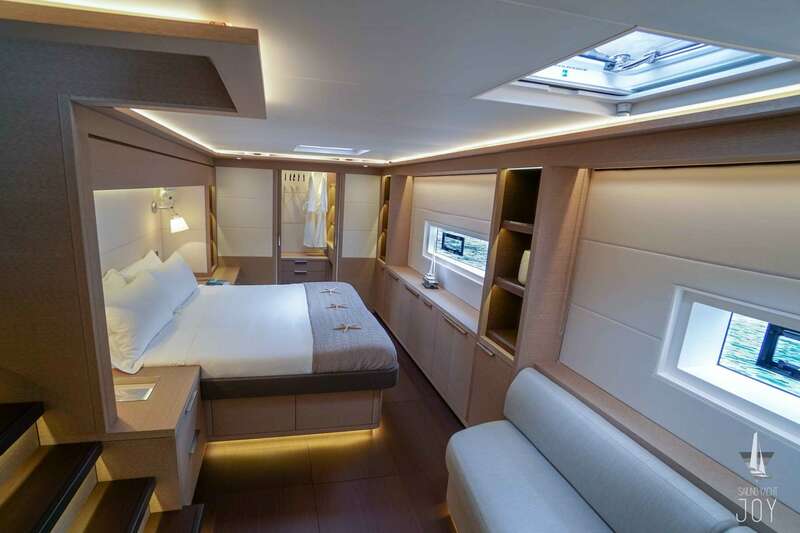 As a fully crewed yacht, guests have to simply arrive and relax and enjoy all that this beautiful luxury catamaran model has to offer. Finished to the highest standard, with superyacht DNA in its design, SY JOY offers extensive on board spaces for its guests to enjoy. 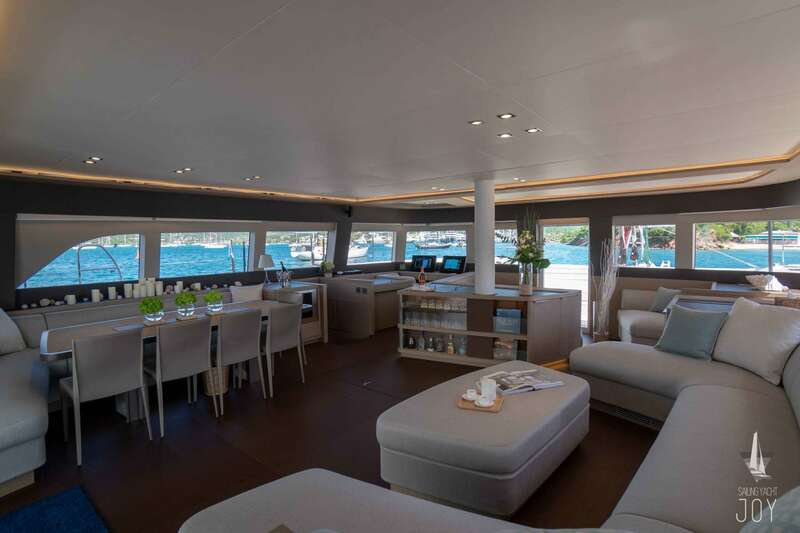 Large open spaces, with an easy flow, make the most of the catamaran’s huge volume and huge windows flood the yacht with light. 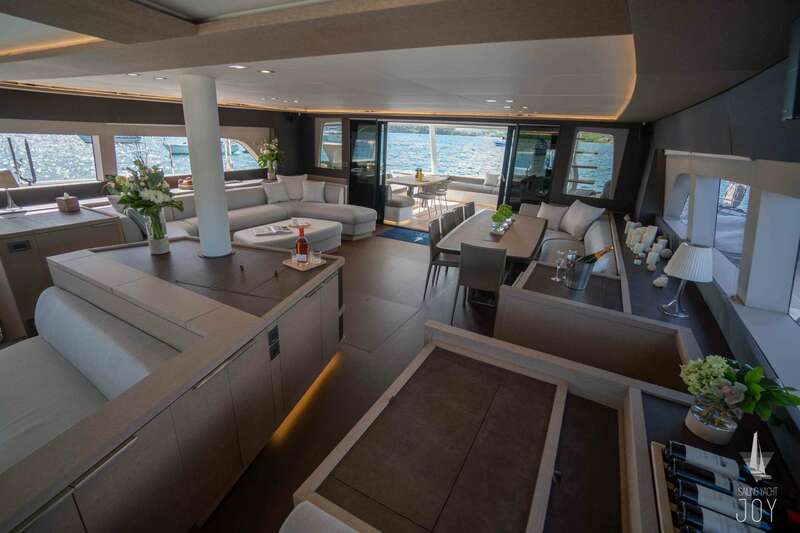 Located on the main deck the huge main salon forms the heart of the yacht, with sofas, a bar, dining space and entertainment systems. Just like the interior, the three main exterior spaces are huge and provide the perfect base for outdoor living. Leading directly out from the main saloon the large aft cockpit is home to a dining space, extensive seating and direct access up to the flybridge and down to the transom. The forward cockpit includes informal lounge seating, perfect for sheltered relaxation, and provides direct access on to the trampoline net for relaxing and sunbathing. 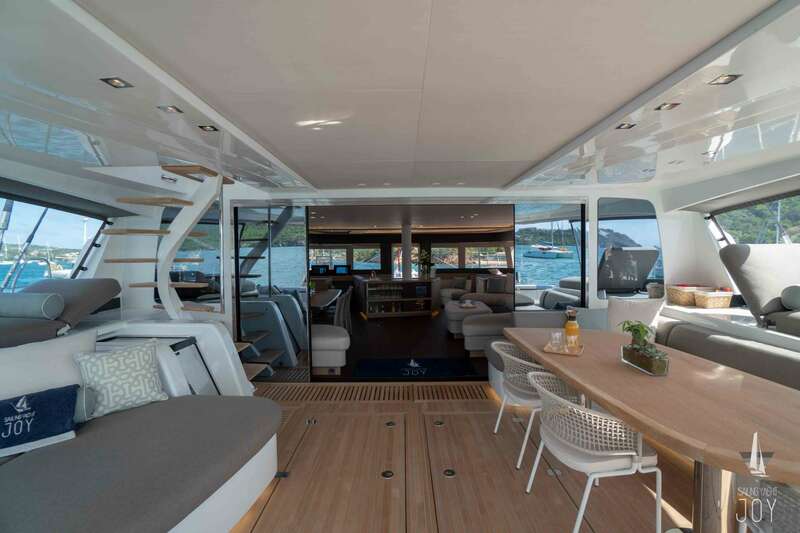 Moving upwards, the flybridge with hardtop – ideal for protection from the heat of the day – is yet another beautiful space with a navigation station, sunpads, seating and unspoiled views across the water. SY JOY being a luxury catamaran for charter is perfect for water lovers and an especially impressive feature is the transom beach club, which opens up at water level to create a base for swimming and water sports, or as a tender dock or prime spot for guests to relax and enjoy the close proximity to beautiful, crystal clear waters. A full sail inventory allows guests to appreciate the serenity of sailing between beautiful destinations. 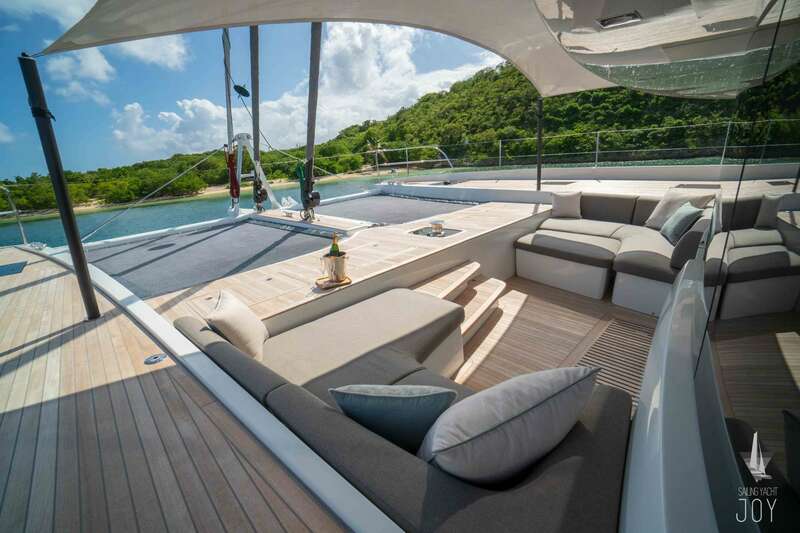 A perfect all-rounder yacht, it is no surprise that the Lagoon Seventy 7 has been such an instant success story. We look forward to helping to welcome you on board for your own unforgettable charter experience very soon.